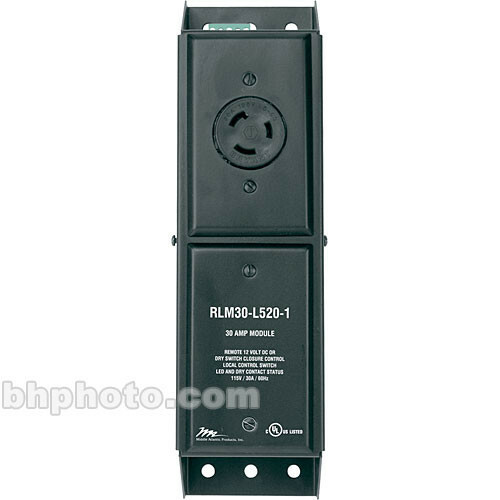 The Middle Atlantic RLM30-L520-1 30A Stand-Alone Power Module with NEMA L520 Plug provides switchable power distribution for components requiring 30A of power. The RLM30-L520-1 can be controlled locally or remotely by using the Middle Atlantic USC-6R universal sequencing controller or any controller that sends 12 volt DC or contact closure outputs. Features integral arc suppression for increased contact life and dual 30A relays for intrinsic reliability. Incorporates "soft" start functionality to prevent high in-rush current. Mounts in rackrail brackets, vertical lacer bars, or on any surface. Features 0.5" and 0.75" knock outs on the sides and bottom for wiring to power sources. Comes with a NEMA L520 20 Amp twist lock plug, making the RLM30-L520-1 ideal for applications where amplifiers draw 20 Amps of current but you need greater switching reliability. Box Dimensions (LxWxH) 13.0 x 5.0 x 3.5"